Corrections are healthy for markets to grow. 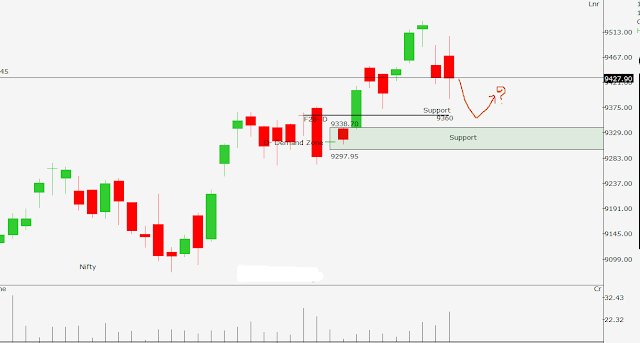 A Hanging Man pattern (candle of 17 May) on daily chart as seen below was the first indication of a gap down. 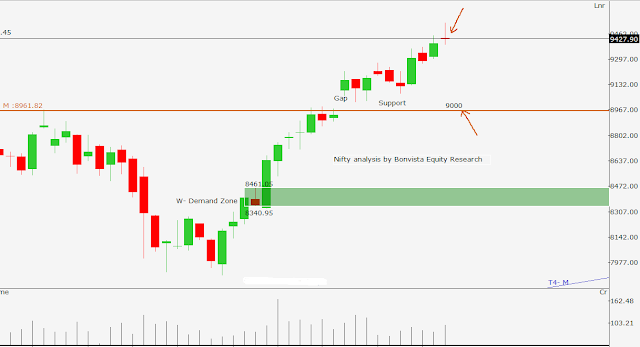 That gap down has come the next day (18 May) and markets fell by more than 90 points on Thursday. An attempt to recover on Friday got sold and markets ended in red off the low. These are early signs of corrections. However we can not predict the quantum of the correction. As you can see on the chart below, there are 2 supports. One is at 9360 and next is immediately in the range of 9338 and 9297. These 2 are areas of hope for markets to turn up again. On a little larger scale as seen on weekly chart below, the selling pressure is indicated by a Gravestone Doji formation. Yet there is no confirmation of a correction on weekly chart. We have 9297 as crucial level. If this level breaks on closing basis the next week, we might assume the start of a substantial correction. If this happens the next major support is at 9000.